On the evening of January 22 2014, the U.S. Cranberry Marketing Committee (CMC) celebrated the Chinese New Year with the launch of a new cranberry beer by Boxing Cat Brewery in Shanghai, China. Spanning two floors of the Boxing Cat Brewery flagship Shanghai location, the celebration hosted nearly 100 guests. More than half of attendees represented CMC China partners that had contributed to the highly successful first year of U.S. cranberry marketing in China. These included major industry and consumer lifestyle media, importers and distributors, e-commerce websites, and bakeries. The celebration was also joined by Boxing Cat Brewery’s VIP guests: beer connoisseurs and home brewers that loyally attend Boxing Cat’s beer launch celebrations. 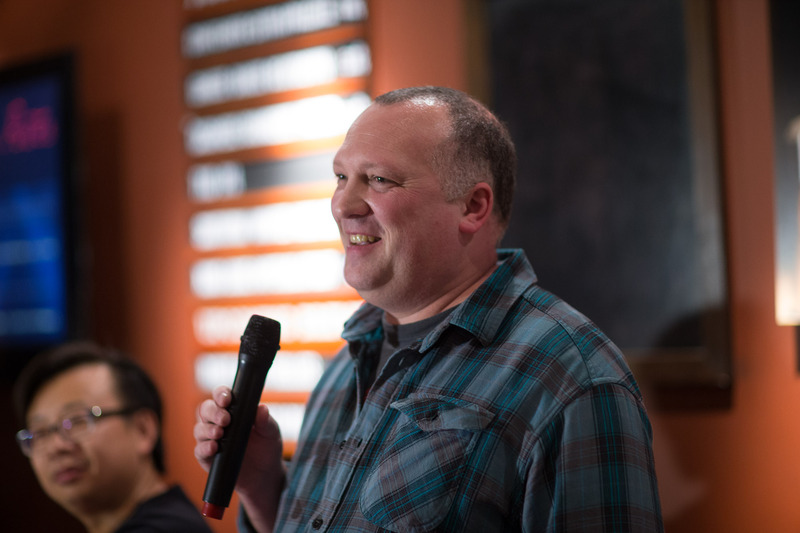 The event kicked off with a speech by Boxing Cat Brewmaster, Michael Jordan, about how the concept for the beer was born and the brewing process. Attendees sipped their beers as Michael told the story and explained how the ingredients were chosen and combined to create the luxuriously dark yet smooth wintertime brew: Cashmere Cranberry Porter. Opening remarks were also delivered by Keith Schneller, Director of ATO Shanghai, and a speech by Scott Soares, Executive Director of CMC, was read by Mabel Zhuang, the CMC China consultant. Michael also recited a poem prepared by Scott especially for the occasion which received a hearty round of applause and to which everyone toasted. During the opening remarks and Q&A session, attendees enjoyed samples of the new brew along with a dish specially created to pair with the beer’s flavors: Crispy Duck Nuggets on Cheese Crisp with Bacon Cranberry Relish. CMC China invitees also enjoyed a festive holiday meal including several dishes prepared with U.S. cranberries, as the story of the beer and brewing process was retold by Michael with Chinese translation. Cranberry samples and pamphlets were arranged on every table, and U.S. Cranberry banners were displayed throughout both floors during the celebration. Both Chinese and expat attendees greatly enjoyed the beer and paired dishes. Throughout the event, comments from attendee conversations could be overheard complementing the beer’s flavor, color, and smoothness, as well as strongly positive evaluations from home brewers about the difficulties in creating fruit beers and the successful balance achieved in this brew. 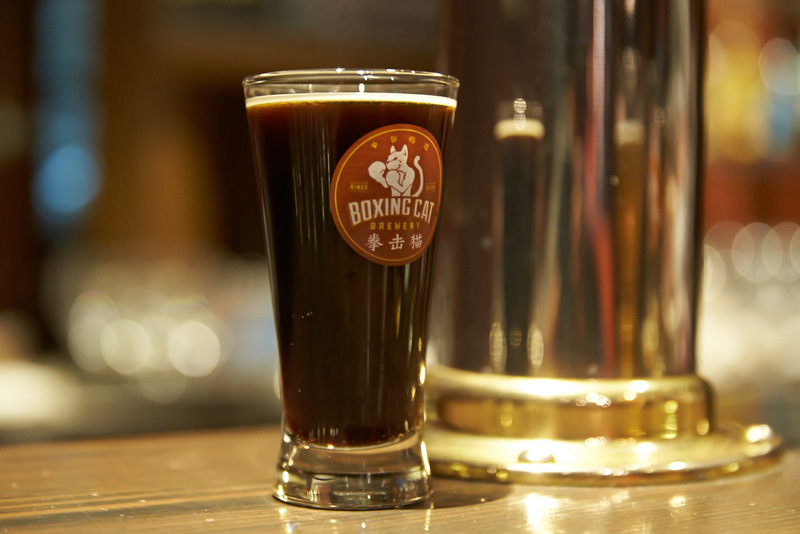 Boxing Cat’s Cashmere Cranberry Porter is the first cranberry beer brewed in China, and perhaps the first in Asia. A shining example of the versatile applications of cranberries, the beer uses dark chocolate imported from Belgium and cranberries from the U.S., combining the cranberry tartness with the chocolate sweetness. Imported malts used during the brewing process contribute a nice note of caramel and a light roastiness. The delicate use of hops allows the cranberry and chocolate to shine through the aroma and finishing flavor, giving the smoothness of the beer a similarity to fine liquid cashmere. It will be a limited release beer, pouring through February at both Boxing Cat Brewery locations. The beer represents a collaborative effort between Boxing Cat and CMC which utilized the USDA’s Quality Sample Program to provide frozen cranberries and cranberry puree for the beer’s development. The concept for the beer was born when Scott and Michael were introduced over a casual dinner and the topic of a cranberry beer arose. It was quickly decided that would be Michael’s next project, and less than one month later, the beer was already brewing. As the first new cranberry product launched in China in 2014 with the support of CMC, and based on the highly positive atmosphere and reactions from CMC China partners, the event provides great optimism for U.S. Cranberries in China as the Year of the Horse rapidly approaches.